Surbhi Jyoti is giving Niti Taylor a TOUGH COMPETITON! While we relate to how exciting it is to be a fashionista we also know that it’s a challenge to keep up with the trends considering the pace at which they change. It is said that beauty lies in asymmetry and the ethnic wear segment is marching towards an array of styles particularly the high-low hem lines. Fashion is fun and flighty at the same time. You never know what trends will follow the next season. 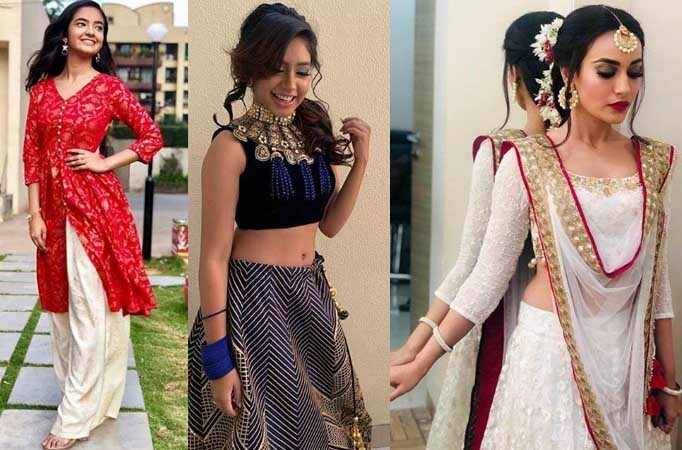 Surbhi Jyoti, Anushka Sen and Niti Taylor look fabulous in ethnic wear and we spotted them posing in articulately designed outfits for candid shots. Surbhi looks like an Indian version of Snowhite in this ethnic outfit while Anushka’s red kurti and golden palazzo can have people smitten. Niti, on the other hand, looks like a black beauty. Who looks better - Surbhi, Anushka or Niti?